Miami, FL -- Mariana Gardinali, Charlotte Farolan and Alina Escoto are like many other 20-year-old college students: eager to learn, full of new ideas, and not conforming to the way things are. But these college undergrads are doing something to change what they see around them, and their work involves a van and school visits. 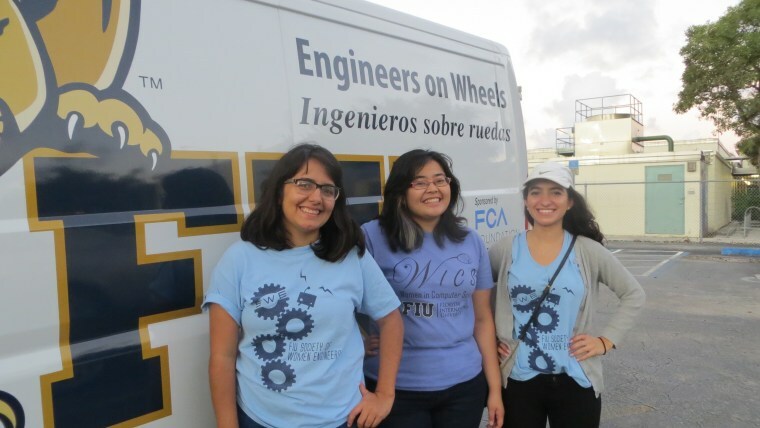 They share a love of robots and go to the same school, Florida International University where they study engineering and are members of the Society of Women Engineers. They have something more in common, something they want to change. About one-in-five (19.57 percent) U.S. engineering students are female, according to the 2014 American Society of Engineering Education Engineering Statistics, and the young women would like to see those numbers increase. Gardinali and Escoto are part of an even smaller group - Latinas are less than 2 percent of current engineering students. Escoto's family is Nicaraguan and Cuban, and Gardinali's is Venezuelan and Argentinian. Their commitment to changing these numbers has led to their volunteer work at Engineers on Wheels, a Florida International University program that visits middle and high schools to provide students with hands-on activities and engineering experiments and exposure to STEM fields - science, technology, engineering and math. One of their outings was to the Georgia Jones Ayers Middle School in Allapattah, a predominantly African American neighborhood in Miami. “So how many of you know what engineering is?” said Gardinali, the group's leader, to the small gathering of teenagers that surrounded the table that was set up. “Construction”, said one kid. “Robotics”, said another. And little by little the conversation started. “It’s exciting to show younger kids what it's like to do stuff like this," said Farolan, a Junior at FIU who is a member of Women in Computer Science and is of Filipino descent. “I never had hands-on experience”, she said. “You watch always on TV and you are like ‘that’s cool’ but you never see a girl doing it, it’s usually the 'boy genius' doing stuff. We want to show kids that we can do it as women," she said. A girl comes over to Farolan and says, “Can I try it?” Farolan does a demonstration of one of the 2 robots they brought today: a simple robotic arm that can hold something between its two fingers. The student tries it with a piece of paper and when it works there is amusement in her eyes. Over at the next table Gardinali has advanced her demonstration by making each member of the group build an electric circuit and have it light up. Gardinali said once a young person, especially a female, gets hands-on experience and sees how she can build something, it serves as a trigger to want to explore and do more at a later time. Also an art history major, Gardinali confessed that she didn’t get interested in engineering until later. She said she fell in love with a dress that had lights in it, and then started to focus more on products people had built. "So when I started doing math and science, I knew that I could end up doing something really cool”. Gardinali is graduating in 2016 and already has a job offer. She intends on working and doing her Masters at the same time, which will be paid by her employer. She said this is another advantage of a STEM career. “There are huge opportunities for minorities to get scholarships, you get part of your college funded for, so that’s something we should take advantage of”. When asked what motivates her to use her free time and drive the Engineers on Wheels van to different schools, Gardinali said, “When I was their age this is something that I was not exposed to. I ended a lot of the time kind of lost,” said the young woman, who clearly has found what she loves to do, even though she acknowledges she is in a small minority. “Now that I am starting a job that is all about computers and technology, I don’t see a lot of people that look like me," said Gardinali. She noticed during her internships that her background and culture were very different from most of the people she met. She feels she can make a difference. "I think it’s a huge loss if we don’t participate." The young women know the statistics are low when it comes to Latinas on a STEM pathway, particularly in engineering. But they are determined to help change that, one Engineers on Wheels visit at a time. Beatriz Mendoza is a freelance writer based in Miami, FL.